Gloss finishes have been a popular option within kitchen design for many years, and show no sign of falling out of favour – even with the rise in popularity of matt kitchens. 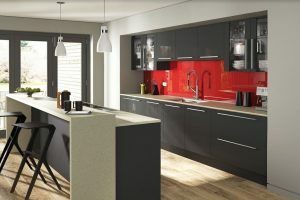 If you are interested in installing your own modern gloss kitchen, you might be tempted to purchase an entire pre-fabricated set from a designer. However, this can be extremely expensive and often does not leave you with much room to add your own personal touches and ideas to the finished product. At The Kitchen Warehouse, we always recommend taking a personal approach and developing your own ideas of what your new dream kitchen should look like – then carefully selecting individual complementary pieces and items to create a space that is just how you imagined. Here is how to do it. A good approach to selecting your ideal space is to first consider the colour scheme of your kitchen. We recommend you draw out a simple sketch of the room (don’t worry too much about the layout at this stage – that will come later) then make a few copies and try out a number of different colour palette ideas on various versions. The best approach is to keep it simple. Many high gloss kitchens are white or monochrome, as the reflections on each surface often add enough interest, and paler colours tend to provide a further increased sense of space. One of the main focal points of the majority of high gloss kitchens are often the countertops and surfaces. The shiny finishes tend to be achieved by the expert application of hard-wearing acrylic or lacquer that is then buffed until it glistens, but they can also be made from highly polished stone. Be sure to select a surface that is durable, as kitchen countertops are often subject to a great deal of wear and tear. The great thing about gloss countertops is that they are very simple and quick to wipe clean and, depending on the material you have selected, do not tend to stain easily. A popular way to create a great look for your gloss kitchen is to select a worktop in a contrasting hue to the surrounding kitchen units to add a little interest that pulls the rest of the design together. One way of doing something really eye-catching is to invert the style that is usually expected and opt for a white – or pale-coloured – surface and darker units. This look is currently very popular and gives the impression of a very edgy sense of design. It is probably a good idea to keep your unit, cabinet and soft closing drawer doors a fairly uniform colour when designing a gloss kitchen, as too much contrast here may undermine the sense of flow that the reflections in shiny surfaces can achieve if they are all one hue. Of course, it is often fun to break up a solid colour with a little flash of something else. You might consider dividing one large white gloss island unit with a slim column of shiny black drawers, for example. Another contrast you could use is that of gloss and matt. Be careful with this one, as units can end up looking mismatched. A good way to employ this approach is to select matt kitchen accessories, kitchenware, bins, storage boxes and artworks and display them against shiny surfaces. Doors and drawer fronts that are finished in gloss share the benefits of shiny surfaces in that they too are much easier to clean than many other alternatives. You may wish to display the beautiful sheen of your doors by fitting them with soft close hinges, so they pick up and reflect as many of the different lights in the room as possible as they glide shut. One of the reasons that gloss kitchens are so popular is the increased sense of space that can be achieved by installing reflective units throughout a room. For this reason, it is always a good idea to select the full complement of overhead and cupboard units in a square or horseshoe shape, with the main preparation surface in the centre, to allow the light to bounce as symmetrically as possible. Of course, there are plenty more options open to you besides this – you can have fun manipulating the flow of light and the feel of the space by trying out numerous different light fitting options. A spread of smaller LEDs will provide good general coverage that will be assisted further by the reflective surfaces, while larger individual fittings and bulbs can help to create focal points and direct the gaze to parts of the design you wish to enhance. After you have drawn up a few ideas, you should start looking around showrooms to see if you can discover the units and fittings you have been dreaming of. Kitchen specialists should always have someone on hand to help you, so be sure to discuss your ideas with a member of staff to see if they have any suggestions. Ask as many questions as you can and, of course, be prepared to accept the fact that one idea may not work as you’d like it to. It’s highly likely that the member of staff you’re speaking to will have superb suggestions to make everything work out. The Kitchen Warehouse’s showroom can be found at Hutton Moor Farm, Hutton Conyers, Ripon, North Yorkshire, HG4 5LZ, and is open between 9am and 6pm from Monday to Friday, and from 10am to 3.30pm on Saturdays. Our expert team members will always be on hand to chat with you. We can provide everything from individual high gloss doors to whole units and any complementary accessories you may need to achieve the perfect finishing touches.